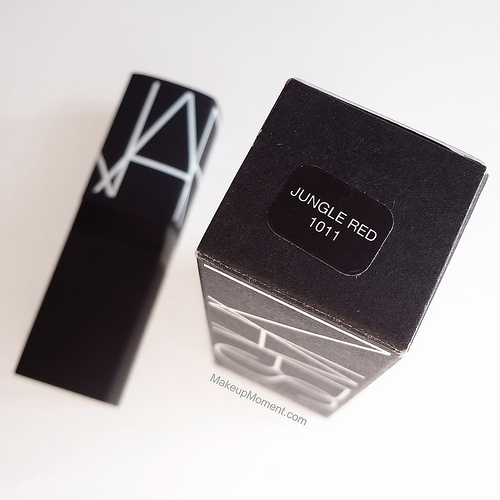 A few weeks ago while browsing the NARS display over at Sephora, I decided to finally purchase the very much raved about Jungle Red lipstick from NARS ($24.00). 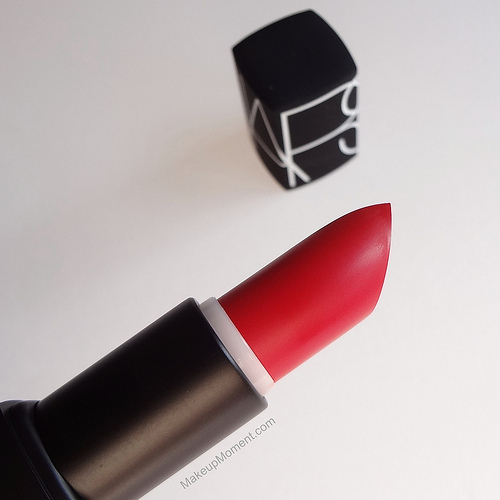 And honestly, I think this may just be one of my new favorite red lipsticks. It could not have arrived in my life at a better time, too, with the holiday season approaching and all. Jungle Red is a showstopping, vivid true red that packs a punch in the pigment department. My swatch pictures do not do this beauty any justice. It's a super rich shade that adds a lovely classic feel to any makeup look. When I first saw the color in the tube, I thought that it would for sure contain a pure matte finish. So imagine my surprise when I first applied it, and discovered that the finish was more of a semi-matte. It has the best of both finishes-a matte base with just the right amount of creaminess, that makes for a very pleasant texture. Speaking of texture, Jungle Red has a smooth consistency that glides on effortlessly. It feels so smooth and lightweight on-even all throughout the day. Also, I love how this lip color doesn't enhance any dry bits my lips may have. But of course as with any lip color, I always suggest prepping the lips prior to application, to obtain the best looking results. 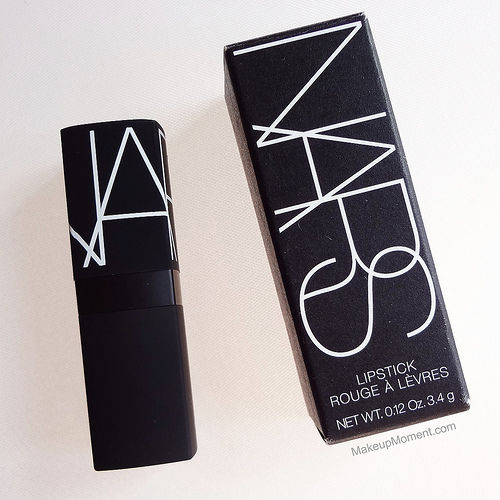 As in typical NARS fashion, this gorgeousness is housed in a sleek, matte, rubberized tube, that just embodies sophistication. Gotta love that. I am really impressed with the lasting power of Jungle Red. This lipstick definitely has the strength to hang on for hours, with very minimal, even fading, and only one touch-up required throughout wear time, if desired. I did eat and drink a beverage with this lip color on just to see how well it would fare, and I am happy to report that it held on pretty well. I experienced some light fading but for the most part, the color still looked really good on my lips. Almost like a stain effect, but more saturated. Overall: I only have a handful of red lipsticks in my stash, but Jungle Red is definitely one of the better reds that I have tried so far. The quality is there, it's a suit-all kind of shade, and it's a red that will work not only for night-time looks, but it's pretty wearable for daytime wear too. This lip color is a winner and the raves that Jungle Red receives are very well deserved, I think. I highly suggest giving it a try! 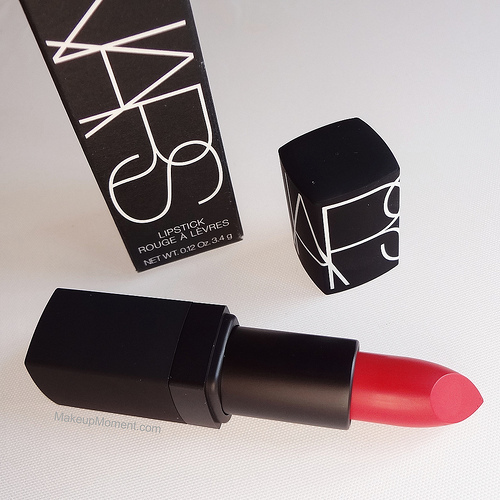 What do you all think of NARS Jungle Red Lipstick? Which are your favorite red lip colors? Very pretty color!! You can definetly tell it is higher end on your lips!! My lower end reds tend to look like glossy not sleek like this one!! Thanks, Kat! :) I hope you give Jungle Red a try. I am sure you will love it! This looks amazing on you Alina! Thanks, Elizabeth :) This would be a nice red to keep in mind but, stay tuned because I have a few more deep toned lipsticks that I will be sharing in the coming days!